Be the first to share your favorite memory, photo or story of Una. This memorial page is dedicated for family, friends and future generations to celebrate the life of their loved one. 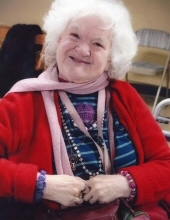 Una Gail Eskridge, 77, passed away Wednesday, April 3, 2019 at Baptist Health Floyd in New Albany, Indiana. She was born April 1, 1942 in Floyd County, Indiana the daughter of Galen and Lucille Duvall Eskridge. She was a production worker at Rauch Industries in New Albany, IN. She was preceded in death by her parents; her brothers, Michael and Wendell Eskridge and sisters, Flora Lee Loeffler and Joyce Taylor. she is survived by her brother-in-law, Leroy Taylor of Salem, IN and sister-in-law Joyce Gunn Eskridge of Georgetown, IN and numerous nieces and nephews. Funeral services will be at 2 PM Saturday, April 6, 2019 at Gehlbach & Royse Funeral Home in Georgetown, IN. Burial will be in Edwardsville Cemetery. Visitation also be on Saturday from 11 AM until the service at 2 PM at the funeral home in Georgetown, IN. To send flowers or a remembrance gift to the family of Una Gail Eskridge, please visit our Tribute Store. "Email Address" would like to share the life celebration of Una Gail Eskridge. Click on the "link" to go to share a favorite memory or leave a condolence message for the family.